A sacrament is a holy act – a ritual of our faith. 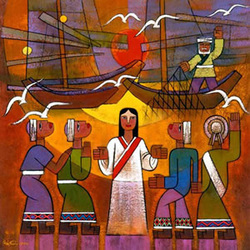 The United Church has two sacraments: baptism and communion. These are of central importance to our faith. Baptism is a symbolic action that signifies the new life God gives us as we join the church community. Baptism uses water as a symbolic cleansing that signifies the acceptance of new life within the church family. The sacrament of baptism is the single rite of initiation into the Christian community, the church. The United Church offers baptism to all ages. We believe the gift of God’s love doesn’t depend on our ability to understand it, so we baptize people as infants right up through adulthood. For children, instruction is given to parents or sponsors to equip them for the child’s Christian nurture. During the ceremony, everyone in the congregation pledges support for the child and his or her parents. Baptism is not a requirement for God’s love. We believe people who die without baptism are in no way condemned, lost, or damned. Baptism in the United Church is recognized by all denominations of the Christian church that practice infant baptism. Similarly, if people have already been baptized in another church, the United Church recognizes their baptism and welcomes them as Christians. We generally celebrate the Sacrament of Communion at least once each month. Often it is celebrated on Special Days in the life of the Church, such as the First Sunday of Lent, Palm Sunday, Pentecost and World Wide Communion Sunday. In the United Church all people are welcome to celebrate this Sacrament . It is a tradition within the United Church to unite in solidarity with those who are in recovery and therefore we share grape juice with each other instead of wine. Rice crackers are also be made available for those who require gluten-free.